The second post in this short series on good communication covers creating a communication plan. As I discussed in my last post, good communication is a major success factor for projects. So how do you create good communications for a project? The start of good communication lies with the communication plan. During project planning, it is best to maintain this inside a table. 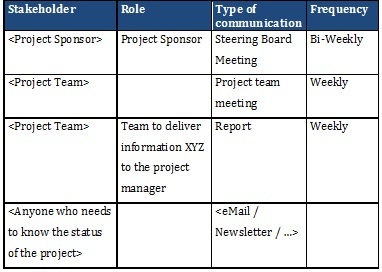 A simple communications plan template is shown to the side. The first place to start is to check that you have a full list of project stakeholders available. The project stakeholders needs to be created at the beginning of the project and then maintained as the project progresses. Using this list will make sure that nobody is missed out when the communication plan is created. The project sponsor is arguably the most important person involved in the project. Their needs should be covered first. The communication plan will need to include how often the project sponsor expects to see a progress report and which meetings they would like to attend. If possible, attempt to organize meetings with the project sponsor at the end of the week or early on Monday. 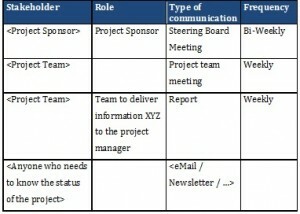 The meetings with members of the project team are the next most important items to enter into the communication plan. My preference is to have a team meeting with all the members of the team together and smaller, one-to-one meetings, with each team lead or team member. The team meetings are used to share status between all members of the team. The one-to-one meetings are used to discuss problems, issues, and provide advice on how to solve them. Whether I am having meetings with the team weekly or bi-weekly, I prefer to have the meetings at the beginning of the week. I want the team to be able to act directly on the topics that we have discussed. If the meetings are at the end of the week, then it is too easy to put the work off until after the weekend. Work that can be put off until after the weekend is then often put off until the end of the next week, or just doesn’t get done. The other relevant factor to consider is that you will need up to date information for your project sponsor meeting. Therefore, you will need to set the meetings with the team to ensure that you have accurate, up-to-date information, for your project sponsor. Not just meetings, but also the reporting schedule needs to be agreed and entered into the communication plan. Generally, you will have two types of report. One type of report will provide you with the data that you need to track progress on the project. This type of report will typically be used to provide data to the meetings with the project sponsor and, possibly, your regular team meetings. The other type of report will be produced by you to share the overall progress of the project with the project sponsor, the project team, and any project stakeholders who are outside of the main project team. This type of report may need to be reviewed and approved by the project sponsor before it is sent out. Therefore, this type of report will be delivered after the meeting with the project sponsor. In general, it is helpful to have the project progress reports that provide summary information for a wide stakeholder group to be sent out on Fridays or Mondays. This summarizes the achievements of the previous 1 (or 2) weeks. For some projects, it is necessary to keep a wide audience of people informed of the project progress. These receivers of these newsletters are normally the people who are not involved in the project directly. They do however have a justified interest in knowing the project progress. Adding a regular newsletter to the communication plan will fulfill this need. A newsletter may be produced monthly or even quarterly. It is intended to keep the wider audience aware of the broad strokes of the project progress and would not normally go into the day-to-day issues and problems. My third post in this short series on good communication will look into motivating your team by explaining the purpose of the project.